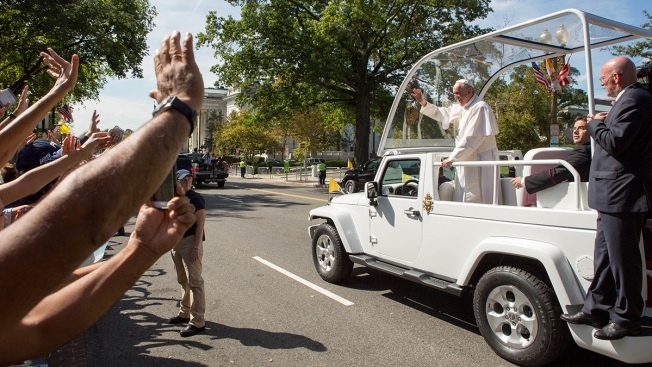 Pope Francis waves to the crowd as he rides in a popemobile along a parade route around the National Mall on September 23, 2015 in Washington, DC. Chants of "We love Francis, yes we do!" rang as thousands jammed the White House Ellipse Wednesday for a glimpse of Pope Francis. And the faithful got everything they hoped for. 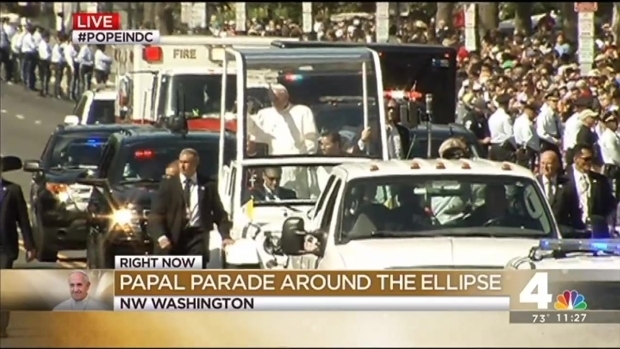 The pope, in Washington, D.C. for the first full day of his historic U.S. trip, blessed two babies and one young girl, who were carried from the crowd by guards. He waved and smiled at the throngs, who were separated from the Holy Father by metal barriers and a line of shoulder-to-shoulder law enforcement officers. The faithful left overjoyed. Some held hands and sang as they headed en masse to Metro stops. "It was awesome, I just wanted to be in his presence," Larry Groves said. "It was worth standing here since 7:30." Before the pope's trip around the Ellipse, the park south of the White House, he had spoken with President Obama and a crowd of 15,000 on the White House's South Lawn, in a speech that called for cuts to air pollution and better stewardship of the environment. Many people arrived to the parade route very early in the morning, with beauitful weather that threatened to get hot. They pushed toward barricades when the pope arrived at the White House, some wearing hats, scarves or handkerchiefs to block out the sun. Some children sat in trees for a better view; students waiting for the pope to pass by sat on the ground and did homework. Many in the crowd said they identified with Francis' image as a man of the people. "I think that he's a really down-to-earth man who tries to connect with everyone," said George Washington University student Marshall Cohen, who had draped himself in a flag from the Vatican. "He's really close to people and seems to care," said Maria Monroy, of Colombia. Even people who weren't a part of the faith came for the parade. "I'm not even Catholic and I came to see our pope," said Esther Greene of Chantilly, Virginia. "He's so humble and he cares about the people. He really is a people person." 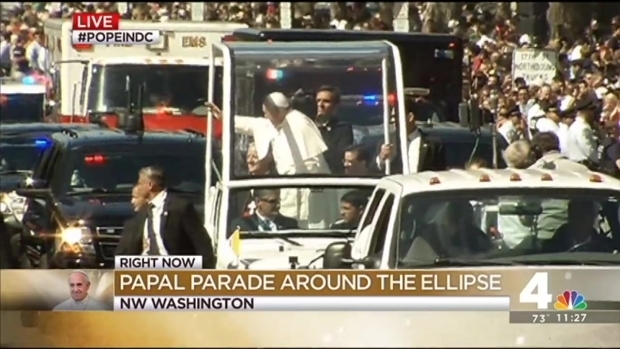 Francis didn't get out of the popemobile and walk among the people, which he has done on other occasions. "That would be unbelievable," Cincinnati resident Jean Smith said before the parade began. "I wouldn't be surprised – I think that's why people are drawn to him." "I wish he would've come out of his motorcade," said D.C. resident Iris Ventura. She thought tight security was the reason why Pope Francis stayed in the popemobile. Still, she found his trip amazing. "No other pope has had the opportunity to talk to Congress like Pope Francis will," Ventura said.